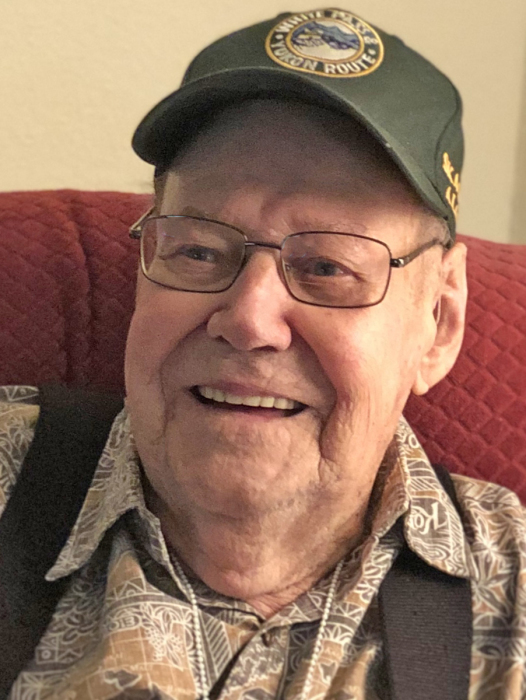 Earl Grant Moon, 94, a lifelong St. Joseph County resident, passed away on Tuesday, February 12, 2019, having spent his last days surrounded by his loving family. He is survived by his wife of 70 years, Dorthy Moon; his brother, Maynard; two sons and daughters-in-law, Patrick (Rita) Moon and Phillip (Carol) Moon; two granddaughters, Rebecca Moon and Andrea (Francesco) Verteramo; three great-grandchildren, Maria, Domenic, and Regina; and numerous nieces and nephews. Grant was born, one of nine siblings, in Lakeville, Indiana on March 30, 1924 to John and Etta (Fisher) Moon. He lived there until 1942, when he enlisted in the United States Army and was stationed for several years in India, in charge of a supply depot. He was honorably discharged in 1946 as a World War II veteran. Subsequent to his discharge, he was diagnosed with appendicitis and was admitted to Epworth (later Memorial) Hospital for surgery. It was there he met a student nurse, Dorthy Shupert, who had been watching over him when he awakened from the anesthesia. Although they both had boy/girl friends at the time, the attraction was too much to ignore, and they were eventually married on June 5, 1948. Their commitment and devotion to each other was still evident to their sons when they celebrated their 70th anniversary in 2018 over a dinner with them at their favorite restaurant, Doc Pierce’s. After returning from WWII, Grant bought and operated a gas station on Western Avenue in South Bend for many years. Upon selling that business he went into the sales profession and proved his ability to sell pretty much anything. He worked in many diverse fields, including electronics and appliances, automotive, insurance, real estate, mausoleums and many others. He was the quintessential master salesman and enjoyed conversing with and selling to people as much as they enjoyed buying from him. Having learned well from his father, a master carpenter, Grant put his own carpentry skills to work and built a two-bedroom cottage on Kelsey Lake near Cassopolis, MI, in the early 1960’s. It was there that he and the family enjoyed summers and weekends for about ten years. It was about that time that he joined the Masonic Temple Saint Joseph Lodge #45 and achieved the rank of Master Mason in 1962. In 2013, he received an award for 50 years of service. When they retired, Grant and Dorthy became “snowbirds” for 20 years, spending their summers in South Bend and their winters in Winter Haven, Florida. A memorial service will be held at a later date. Palmer Funeral Home—Hickey Chapel is assisting the family with arrangements. In lieu of flowers, please make contributions to Shriners Hospital for Children, 2211 N. Oak Park Avenue, Chicago, IL 60707-3392, or Hospice Foundation, 501 Comfort Place, Mishawaka, IN 46545. Online condolences may be left for the Moon family at www.palmerfuneralhomes.com.